KoopaTV: Travis Strikes Again: No More Heroes Released... And More Best Buy Shopping Adventures! Travis Strikes Again: No More Heroes Released... And More Best Buy Shopping Adventures! By LUDWIG VON KOOPA - I bought Travis Strikes Again: No More Heroes. There's more to the story than that. I last wrote about Travis Strikes Again: No More Heroes in September, writing about its delay to January 2019 (a very smart delay) and how I was still unsure if I should buy it. Either way, January 2019 is here (specifically Friday, January 18) and the game has released. I decided to go to Best Buy today and see if I would impulsively buy it or not. Moment of truth time. I do want to support the No More Heroes franchise, after all. But Travis Strikes Again strikes me as something to be wary of... again and again. (There's wordplay in that sentence.) That said, it's something I've been paying close attention to since SUDA 51 appeared on that stage when the Nintendo Switch and its concept was formally introduced. The first thing I see when I get to the Nintendo section of the store is that Travis Strikes Again: No More Heroes is nowhere to be found. Instead, another game that I've been agonising over the purchase of was there, and in eye-catching fashion. A Hollow Knight bundle featuring a plushie and the game code? For $35! This is still a digital-only game, but now there's a physical in-retail bundle with a plushie “presented by fangamer.com.” The last time I had a “Ludwig goes to Best Buy” article, I wrote about the importance of merchandise like this. I'm a total sucker for it. Since I want Hollow Knight and I have full confidence in the quality of Hollow Knight, I bought it. I figured that there won't be a true physical version of it ever coming, so this is as good as we'll get. 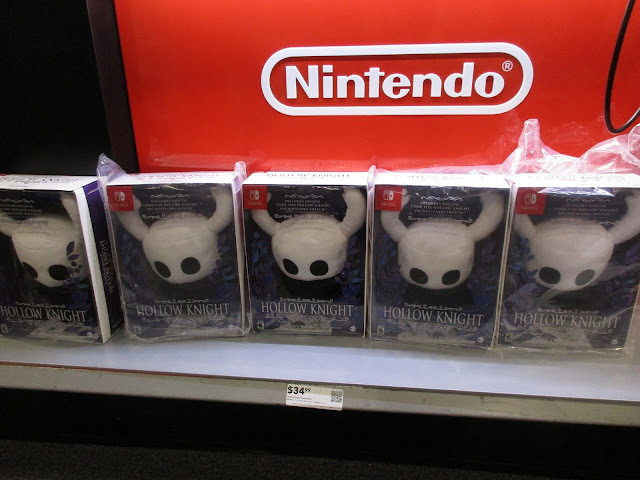 Hollow Knight clearly passed the impulse buy test, since I never expected to see it here. Otherwise, I saw some amiibo like Ridley, Wolf, and the Octoling Boy/Girl/Octopus set. Didn't buy them. 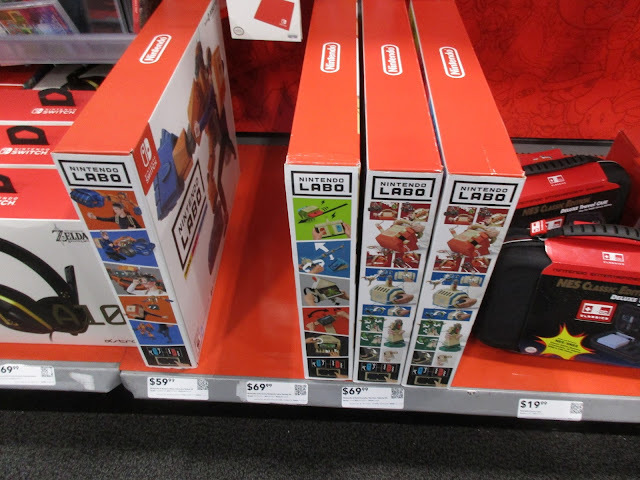 Featuring the Nintendo Labo Robot Kit's sneaky price cut! ...The only urgent need regarding the Labo is to eliminate them entirely. I didn't use my fireballs on them right then and there in the Best Buy, because employees were everywhere. I was one of the only customers in the store, so the employees were bored and kept asking me if I'm finding everything okay. I said yes to all of them. Perhaps they were suspicious that I had a camera and kept taking pictures of everything. Then I remembered that I wanted to purchase a new GameCube controller. I looked around and the shelf label saying wired GameCube controller was devoid of any controllers. Just emptiness. Guess I was beaten to it. I picked up two $10 Nintendo eShop cards so I can give them away in future rounds of the KoopaTV Loyalty Rewards Program (I already have the card for this round, Round 24) and I was going to the register. Near the front of the store is where they have a booth called NEW RELEASES, and lo and behold, Travis Strikes Again: No More Heroes was there. That booth is pretty key—it's where I found Mario Tennis Aces when that came out. Well, I picked up the game, and went to the register. And I got asked for my ID, because Travis Strikes Again is M-rated like the previous two No More Heroes titles... and I'm just so youthful-looking that it's not clear I'm above 17 years of age. (The cashier said the computer made her ask. I guess she could tell.) Anyway, I supplied the ID and paid $40 for the game... plus my other purchases that made me pay Best Buy a lot more that day. There is a box, art in the box, a Nintendo Switch card of the game, and a download code for the Season Pass. 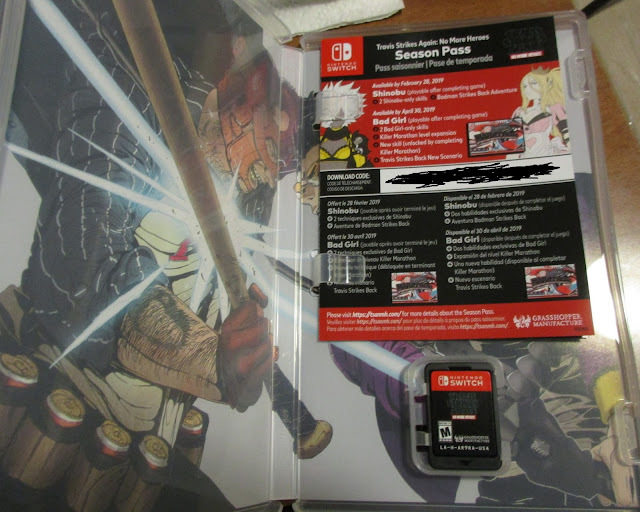 The Season Pass promises post-game (you have to complete the game to access it) content in the form of Shinobu stuff (is this spoiling that Shinobu is in the game?) and a “Badman Strikes Back Adventure” at the very end of February, and then a level expansion and a “new scenario” and playable Bad Girl (the whole point of this game's plot is that she's dead, though?) at the very end of April. Maybe I shouldn't play the game until May, then? To have the full experience? That'll disappoint everyone waiting for my opinion on the game, though. On Monday, Wendy O. Koopa published her three criteria for what makes a good game purchase. While I can't speak to criteria #3, I'll say that Hollow Knight fits #1 and #2. Travis Strikes Again? The concept is iffy, and while I don't know enough about the content to determine what's in it, $40 is probably too high just based on my impression. Judging games before buying them is dangerous, though. All I know is that the best thing from today is that I got a Hollow Knight plush. Ludwig was playing Super Smash Bros. Ultimate while playing this article, so he's apparently not in a rush to play his new games or at a loss for entertainment. You'll never be at a loss for entertainment, either, if you come to KoopaTV every day! Anyway, please feel free to comment on anything in this article, even if it's a tangent. Someday I'll try this series. I'll take plushie + digital bundle > physical that probably won't ever exist.